Queen Elizabeth II on coronation day 2 June 1953. Queen Elizabeth II at opening of parliament. 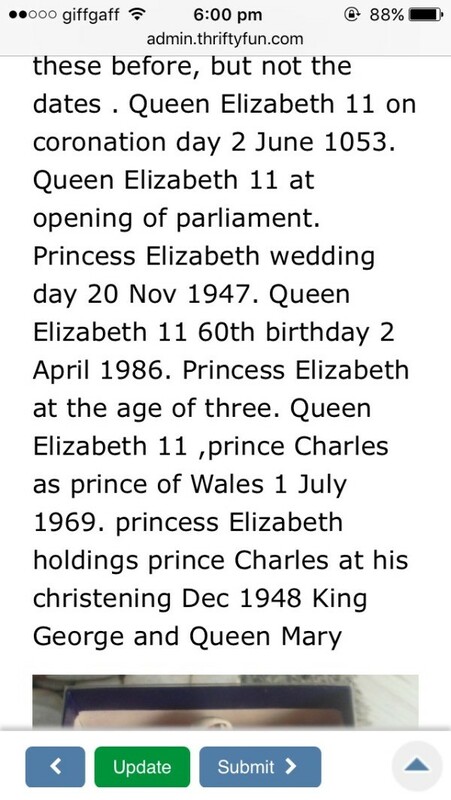 Princess Elizabeth wedding day 20 Nov 1947. Queen Elizabeth II 60th birthday 2 April 1986. Princess Elizabeth at the age of three. Prince Charles as Prince of Wales 1 July 1969. Princess Elizabeth holding prince Charles at his christening Dec 1948. You have a set in an original box so this would make them more valuable but individual thimbles are selling for $5 to $10 on eBay right now. There are over 16,000 collectable thimbles on eBay right now (not very many St George) and I did not see a set but did not check other sites. Since you did not give the date/age it would be difficult to check further but you can check eBay or Google anytime for current listings to see if the value goes up. Just enter St George Thimble and you will be able to check anytime. A set like this is generally more valuable than single thimbles. The additional information would be nice to put in a listing if you were going to place them up for sale on an auction site but it seems this company made several different sets and they are all about the same value. I believe the value is actually less than a year ago. You may not be able to sell your set (today's market - 8/2017) for more than $25 and it may not sell quickly even at that price. Here is a listing in the UK (which is about the same as the US but more popular in the UK) for $19.99 and has several more thimbles. This may not sell either. Just for information - it seems your names are showing 8 names/dates but your box only has 7 showing. 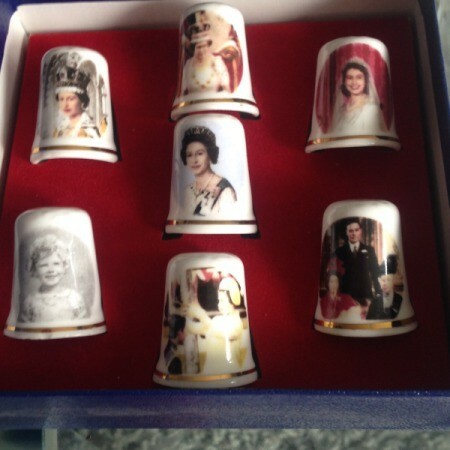 From information I have gathered the sets have 7 thimbles (same as yours) but there appear to be different sets covering different years (different pictures on thimbles). The set on Ruby Lane (seller is in Canada) has an added thimble (nice addition) but I am not sure it is the same set so maybe you can look at your thimbles and see if they match the set offered on Ruby Lane. Your box looks like it is in excellent condition which is a big plus to any collector so I would say that if this set belonged to me I would place the value at no less than $50 and if I were to list it for sale I would start the auction price at $75. This set may not sell overnight but it would sell. I hope you have nice personal reasons for having this set and will value it much more than the actual cash value.